On stage at Page Auditorium on Duke University’s campus, Gregory Porter was a gracious leader, gregarious even with his interactions with a crowd that would give him standing ovations before the evening came to a close. Behind the generous spirit and jovial demeanor, it is easy miss how deeply political Porter’s music is. Porter opened his set with a bouncy, earnest rendition of Donny Hathaway’s “Someday We’ll All Be Free” and closed with his own “1960 What?”—in between Porter offered commentary on the prison industrial complex, Black fatherhood, the corporate takeover of popular music, and dare I say, #AllBlackLivesMatter. That nobody felt as though they were victimized by a badly orchestrated (though exquisitely arranged) protest rally has everything to do with Porter’s deft manipulation of the archive of 20th Century Black musical idioms. Porter’s version of “Someday We’ll All Be Free”—one of the more well known songs from an artist who had few hits and is relatively obscure among general pop audiences—found him in a hopeful mood; as hopeful perhaps as Hathaway was penning the song (with Edward Howard), as he did, with the waning moments of the Civil Rights and Black Power movements as backdrop, and Marvin Gaye’s What’s Going On as blueprint for the melodies of protest. Porter’s subtle revision of one of the song’s lyrics—“keep your manly pride” remixed as “keep your manly and womanly pride” was evidence that Porter is both aware and self reflective of the moment we are in. Porter followed the opening tune with his own “On My Way to Harlem” from his breakthrough recording Be Good (2012). A track that one might expect Porter to open his set with, instead allowed Porter to name-drop himself into a cultural narrative that still resonates for the denizens of Classic Black—Classic American—culture. 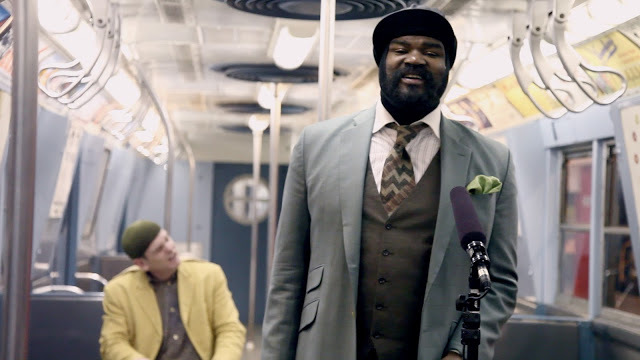 With every new male jazz singer being hailed as the new—fill in the blank—mentions of Ellington, Langston Hughes and oddly Marvin Gaye, as part of the landscape of the capital of 20th century Blackness, earns Porter some street-cred, on the streets that, for example, might take one to Jazz at Lincoln Center. But even as Porter gestures towards his own place in that narrative--a gesture that the audience gladly affirmed--he is keenly aware that they very tradition that he stands on is being quietly eroded by the streaming music service of your choice. And Porter wasn’t afraid to connect the dots; his introduction to “Musical Genocide” (from his most recent Liquid Spirit) and mashed with The Temptations’ “Papa Was a Rolling Stone,” made clear his belief the attacks on musical tradition were veiled attacks on people who are sustained by this music. As “Papa was a Rolling Stone” allowed Porter to delve into debates about Black fatherless--Porter and his siblings were raised by his single mother--Porter’s rendition of Nat Adderley’s 1960 classic “Work Song” was a reminder of the “changing same” that is the Prison Industrial Complex. That Porter began “Work Song” with a riff from “Berta, Berta”--a favorite of Black convict laborers in the early 20th Century--was not too fine a point about the realities of a timeless industry that is largely erected on perceptions--often based on myth--of Black criminality. And given David Guetta’s recent appropriation of “Rosie,” another convict laborer favorite, for his song “Hey Mama,” there seems to be some correlation between mass incarceration and the wholesaling of Black musical culture. Those same perceptions get Black youth killed in what amounts to State sanctioned killings, as Porter attested to in his performance of “1960 What?” a song that gives musical side-eye to notions of social progress. While audiences can get all warm and fuzzy when Porter recalls Martin Luther King Jr.’s murder on the balcony of the Lorraine Motel--a national tragedy held at double-arms length--the unnamed Black teen-ager that gets shot dead with “three pieces of licorice” in the second verse of “1960 What?” by a police officer, was conjured by Porter two years before anyone knew the name Trayvon Martin, and four years before #Ferguson became a ground zero of a national crisis. That there were folks in the audience that were likely disappointed Porter did not perform “Be Good (Lion’s Song)” or “Holding On,” his recent collaborations with Disclosure (of Sam Smith fame), speaks volumes about Porter’s potential reach. Here’s to hoping that as he reaches wider audiences that he remains committed to the very archive that provides the freedom to sing what he sings.